With only three ingredients, you’ve got a hearty tailgating treat that’s perfect for brunch and half-time snacking. 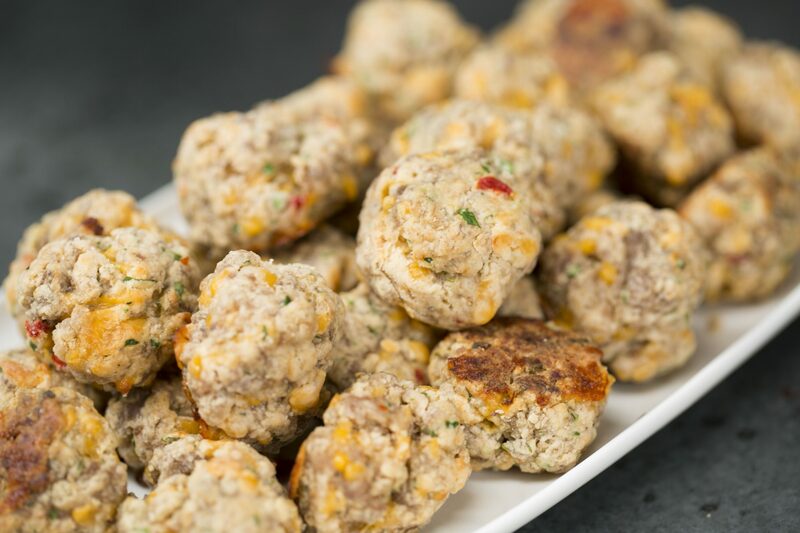 You can roll the sausage balls ahead and freeze them, uncooked, until the morning of the game. Add about 5-10 minutes to the baking time if you are baking them directly from the freezer. You can make a these peppery cheese straws at the beginning of football season and freeze them in air-tight containers after you bake. Just take them out of the freezer as you need them. They’re easy to transport and even easier to eat. Sometimes the most basic ingredients make the most delicious snacks. Give these a try and let us know what you think! Chips and onion dip is always a must-have at tailgate parties, and this onion dip is the easiest of all. You can make it ahead and cover and chill until game day. These tasty stuffed eggs will be gobbled up quickly at your tailgate party, so it’s a good idea to go ahead and make an extra batch. Be sure to keep them chilled right up until serving time. Set up an assembly line to let fellow fans dress their toasts as they wish. This recipe lets you go from light to hearty in no time. Make the ultimate party dip with sausage, cream cheese, Cheddar cheese and spicy tomatoes, and scoop it up with corn chips. 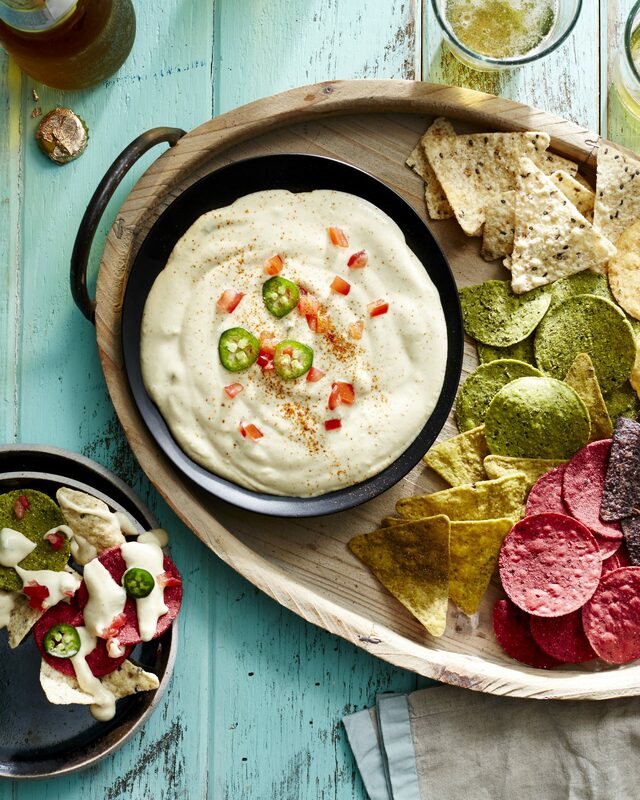 Tailgate fans will be cheering for this dip at every game. Wrap small link sausages in crescent roll dough and bake for a quick and easy tailgating treat. Once they’re baked, you can keep them warm in heavy-duty foil or an insulated casserole carrier. The always-popular spinach dip just got easier. Just combine frozen chopped spinach with yogurt, sour cream and onion, and serve with assorted fresh veggies or chips. When you need a last-minute tailgate appetizer, buy some store-bought hummus and stir in fresh lemon juice, oregano, and a splash of olive oil. Transfer to a festive bowl, and no one will have to know it’s not homemade. It’s nice to have a sweet appetizer at your tailgate party to balance out all the salty and spicy foods. This easy dip is great with apple slices or ginger snap cookies. Slice pickled jalapeño peppers in half, fill with store-bought herbed garlic cheese and sprinkle with chopped pecans for an easy, 3-ingredient tailgate appetizer. You can make these a day ahead and keep chilled until game time. Use store-bought pesto, fresh arugula and mozzarella cheese to make these savory roll-ups in only 15 minutes. They’re great for parties – no fork required – and you can make them ahead and keep them chilled until you’re ready to put them on a platter. Whip up an easy 5-ingredient cheese dip with two kinds of cheese, sour cream and chipotle chili in adobo sauce. The chili in adobo sauce adds a rich, smoky flavor to the dip. Serve with fresh veggies or your favorite crackers or chips. Treat your tailgating crowd to these tasty and hearty grilled sausages as an alternative to hot dogs. These savory roasted pecans are a perfect choice for game-day nibbling but probably won't last until halftime. Smokies are always a big hit at parties, so turn it up a notch by adding a bun and a dab of mustard and relish to make these mini hot dogs. Provide a variety of toppings for Crostini. To get a head-start to entertaining, Crostini may be made one day ahead and stored in a airtight container at room temperture, making them perfect for serving on game day.